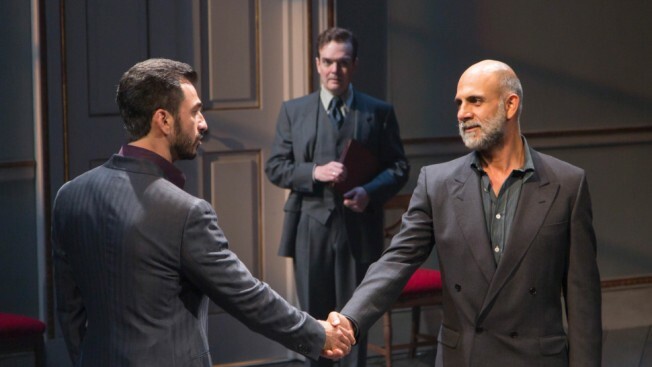 Michael Aronov, Jefferson Mays and Anthony Azizi in "Oslo." The headline "Peace in the Middle East" was plastered all over newspaper and television reports in September 1993 — next to a photo of Israeli Prime Minister Yitzhak Rabin and Palestinian leader Yasser Arafat shaking hands in the White House Rose Garden, moments after signing the Oslo peace accords. It was one of the most iconic moments in the last decade of the 20th century — and to this day, its image is all-but burned into the memories of those who were alive to see it. As the smiling then-Present Bill Clinton standing behind them seemed to be saying to the world, enemies could put their past behind them and agree to a peaceful future. There was hope. Of course history has proven that handshake to be nothing more than an ineffective diplomatic photo-op, despite Rabin and Arafat's Nobel Peace Prize in 1994 for their efforts. Nearly 25 years later, the Arab-Israeli conflict isn't marked with harmony and kumbayas. Turn on the news and you'll see what was left in it's wake: violence, bloodshed and anger — with seemingly no end in sight. But as the gripping new play "Oslo" so effectively explores, those who worked to make the Oslo peace accords a reality were hopeful its end result would tell a very different story. The intense political drama — now open at Lincoln Center Theater's Vivian Beaumont Theater after an acclaimed Off-Broadway engagement at LCT last summer — plays like a live documentary of sorts, revealing the details behind the secret peace negotiations that took place in back-channel meetings between Israeli and Palestinian players for years before Rabin and Arafat ever put pen to paper. (And before American officials were even aware). Though we know the outcome, playwright J.T. Rogers focuses the action of the play on two unlikely protagonists: a young Norwegian couple (Tony winners Jefferson Mays and Jennifer Ehle) who brought the feuding parties together without the permission of their superiors at the snowy Borregaard Manor — a royal estate built by the Viking king Olav Haraldsson (St. Olav) outside the Norwegian capital. Mays ("A Gentleman’s Guide to Love and Murder") in a standout performance leads the charge as Terje Rød-Larsen, a determined yet anxious director of a Norwegian think tank whose unconventional ways of communication pierces through the walls put up by his stubborn house guests. By his side is the superb Ehle ("The Coast of Utopia") as Terje's wife Mona Juul, who single-handedly manages to give "Oslo" the warmth it so desperately needs. An effective diplomat, Mona moves between plugging press leaks in one moment to calming irate personalities in the next. She also serves as the show's narrator, breaking down the action and inner conflicts for those feeling lost along the way. (Often as Ehle speaks, maps and newsreel footage project on the back wall for context — one of director Bartlett Sher's best touches). I'd be lying if I said I wasn't one of those people. Embarrassingly, I in no way understood all of the politics in "Oslo" going into the theater. In fact, I'll admit to finding the play's premise entirely intimidating at first — worried I'd be walking into a dry history lecture filled with battles that landed above my head and interest level. Telling the story from Terje and Mona's unbiased perspective, though, allows "Oslo" to remain clear and relatable. (The real-life diplomats aided Rogers with his script). It's also neither pro-Israeli nor pro-Palestinian in its political stance — something theatergoers with strong political views on either side will surely be relieved by. That doesn't mean Israel and Palestine's motivations are underplayed. As PLO finance minister Ahmed Qurie and his delegation partner Hassan Asfour respectively, the excellent Anthony Azizi and Dariush Kashani never let their characters escape the weight of what's at stake — often exploding in anger over hot-button topics. Across the table is former New York consulate official Uri Savir (the charismatic Michael Aronov, of “Golden Boy”), a newly appointed Israeli politician who appears just as driven by ego as he does his nation's agenda. There's a lot of yelling throughout as the Israelis and Palestinians attempt to hammer out a Declaration of Principles. Who will have sovereignty over Jerusalem? Can the Palestinians recognize Israel as a “legitimate” state? Will the Israelis leave Gaza? Each new question explodes in passionate debate, one more tense than the last. In the end, "Oslo" may not give many answers — but it instead stresses the importance of communication across the aisle, even if the results don't lead to what one might desire. Living in today's divisive political climate, it hard not to feel inspired by that. "Oslo" at the Vivian Beaumont Theater (150 W 65th St.). Tickets: $79-$149, at (212) 239-6200 or lct.org.